On Sunday 14 July 2013, the World Heritage team were pleased to be part of the Wiltshire Archaeology and Conservation Fair held at the Wiltshire & Swindon History Centre in Chippenham. As well as giving information about Stonehenge and Avebury WHS, the team also tested visitors’ knowledge of other World Heritage Sites across the globe – some were more tricky than others! 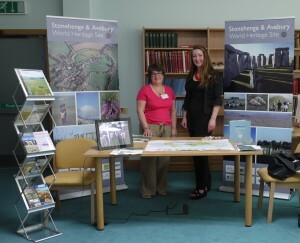 This event saw a large number of heritage and conservation groups attending. They demonstrated to Wiltshire residents what opportunities heritage in their area could bring. There were lots of “hands on” opportunities for families. Museums like the Salisbury Museum, the Wiltshire Museum and the Trowbridge Museum attended. Other groups included: Wessex Archaeology, the Young Archaeologists Club and the Wiltshire Soldiers First World War project. The Conservation Laboratory was also open for visitors to see the amazing work the team do to conserve Wiltshire’s precious past. There was also a fantastic series of short talks covering a range of topics such as recent finds in Wiltshire, how to find out how old your house is and ways to get involved in archaeology projects around the County. It was a great day – look forward to the next one!